Have you ever been stuck on the side of the road with a flat tire? 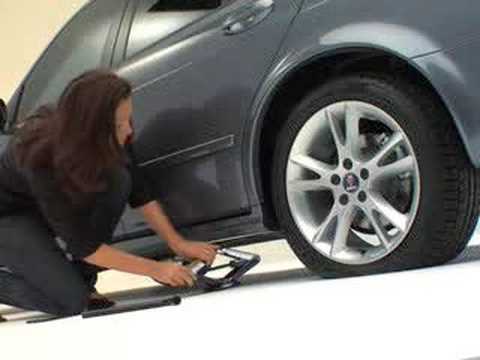 Do you want to be able to change a tire without having to ask for help? Fortunately, changing a tire is a pretty simple task, provided you're prepared and willing to exert a little effort. Secure the vehicle so that it won't roll; and roll the spare tire to the scene of the action. You might know this as breaking the lug nuts. Whatever you call it, find the end of the wrench that fits the lug nuts on your vehicle, and fit it onto the first nut. Apply all your weight to the bar on the left. This starts turning the nut counterclockwise, which loosens it. Don't remove the lug nuts completely; just get them loose enough to remove by hand after you jack up the vehicle. A hollow pipe and a cross-shaft wrench can loosen the tightest lug nuts. Place the jack securely under the edge of the car. Proper locations may vary among vehicle models, so consult the owner's manual for the right places to put the jack. Lift the spare onto the lug bolts. Because tires are heavy, you may have a little trouble lifting the spare into place — especially if you're not accustomed to lifting heavy things. Lower the vehicle and tighten the lugnuts. If your car has wheel covers with a delicate finish, the owner's manual should provide instructions for replacing it. If your car has hubcaps, place the hubcap against the wheel and whack it into place with the heel of your hand. Cushion your hand with a soft rag first so that you won't hurt it. And don't hit the hubcap with a wrench or hammer — you'll dent it. Because the location and type of spare tire differs from one vehicle to the next, if you aren't familiar with your vehicle it's a good idea to check out the spare (and the jack and lug wrench) before trouble occurs. While you're at it, make sure the spare has enough air in it and continue to check that periodically. 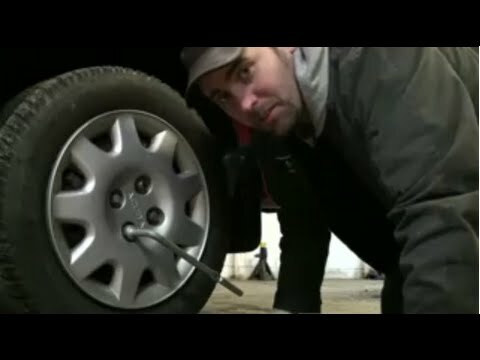 This Video give u information how to change your tire alone. In this lesson u will learn how to change a flat (spare) tire and help yourself.